Recent release “Teen Voices: From the Psych Ward” from Page Publishing author Karin Foster is a captivating look at the unspoken thoughts that lie within the minds of individuals suffering from trauma, depression, and abuse. Karin Foster, a writer and artist with a master’s degree in counseling psychology, has completed her new book “Teen Voices: From the Psych Ward”: a thought-provoking compilation that brings closer to the world of psychiatric patients in the hopes of knowing their stories and understanding the challenges they face. Published by New York City-based Page Publishing, Karin Foster’s inspiring look at the heart of suffering tells how one should be grateful of the chance of living in a wholesome manner. Foster also delivers a strong message of empathy towards those suffering from pain and quietly hiding personal battles in life. 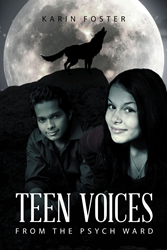 Readers who wish to experience this enlightening work can purchase“Teen Voices: From the Psych Ward” at bookstores everywhere, or online at the Apple iTunes store, Amazon, Google Play, Kobo, or Barnes and Noble.